HelpNDoc's command line interface can be used to automate your documentation generation process: choose which builds to generate, override some settings... and let HelpNDoc generate your updated documentation during nightly builds or continuous integration tasks. HelpNDoc 5.4 includes a completely rewritten command line interface which has been greatly enhanced. 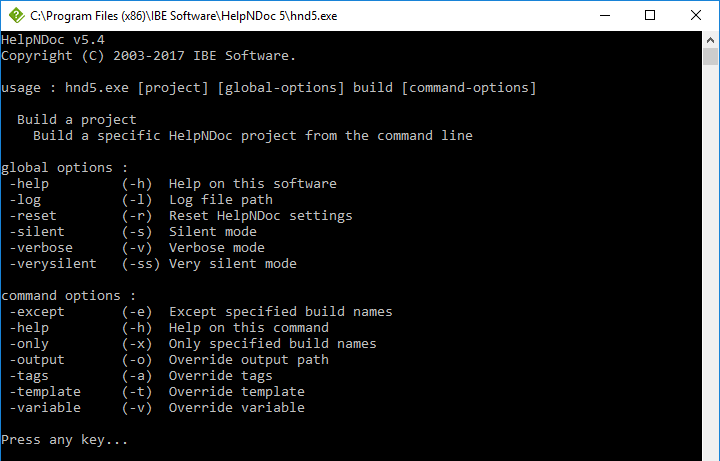 It is now possible to use the "build" command to automate HelpNDoc's documentation generation process: choose which builds are generated, override build's output paths, associated tags or templates, customize project variables... all from the command line. Learn more about the new command line options. The new command line options now include the "verysilent" switch to hide any console dialog, and the "verbose" switch to output additional information. It is still possible to save the log to a specific file for easier integration with an automated build tool. Many parts of HelpNDoc 5.4 have been rewritten to be more reliable, simpler and faster to operate. Anchors are useful to create links to a specific part of a topic. The new anchor dialog provides an easier and faster anchor management system for the currently edited topic: anchors can rapidly be listed, located and deleted. They can also be sorted by name or location. 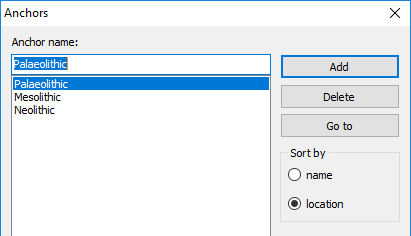 Multiple enhancements, refinements and fixes have been made to the user interface and topic editor regarding High DPI screen settings, such as some color picker which could be incorrectly displayed. Last but not least, HelpNDoc's start-up and shutdown internals have been rewritten to strengthen and speed up the whole process while providing room for future scalability. As always, we have enhanced most generated documentation formats. This update includes many other additions and bug fixes as detailed in the change log below. As always, HelpNDoc is completely free and fully functional for personal use and evaluation purposes. So download your copy now and enjoy documenting!